An exciting exploration of Catherine Blackburn's provocative "Northern Warriors" collection. Catherine Blackburn’s collection ‘New Age Warriors’ stole the show when they hit the runway at Indigenous Fashion Week in Toronto. 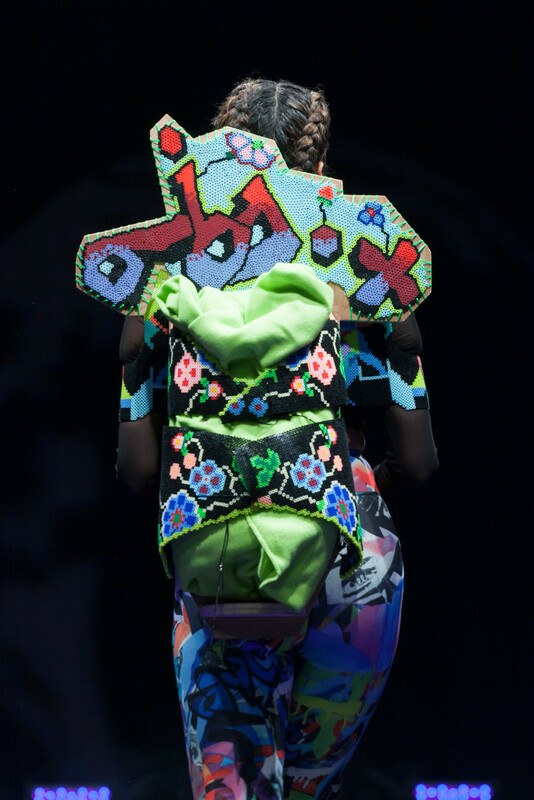 Her vibrant beadwork and stunning accessories dazzled audiences as the futuristic regalia made its way down the catwalk. 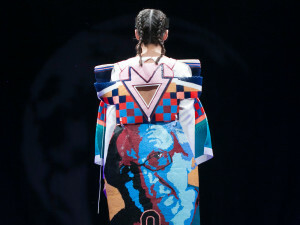 “The coat was initially inspired by the gifted blankets found in Indigenous culture as a sign of respect, and adding the Chief visor on a female was a reference to Matriarchy with 3D-like designing that pushed it into the contemporary. This work as a whole is deeply matriarchal.” Blackburn took the photograph of her grandmother a few years ago for a painting she did, which won a Governor General's History Award. “This coat or shawl was created with Sioux color schemes in mind, mixed with my grandma’s geometric patterning often found in her own work. I wanted the designing to directly reflect her larger-than-life strength and also celebrate her life,” says Blackburn. Blackburn is inspired by other artists, and by the strength and resilience of Indigenous cultures. “The strength in survival is what speaks to me most, but along with that the richness of our cultures; richness in design, color, stories and language,” she explains.